In 2013, experimental math rock then-duo Masiro impressed me a lot with their debut “EP”. It displayed the creativity of guitarist Chris Pethers and drummer Mike Bannard on four songs. The unconventional rhythms and dissonant choices of notes made for an interesting time. However, it felt a bit empty with the lack of a bass in the mix. Much to my surprise, the band released Technocologist Unkown, their debut album, on May first. It was completely unexpected for me, and I was also pleased to hear that a bassist had joined their ranks: Chris Hutchinson-Mogg. And what an addition! First of all, I think he’s the perfect choice, his aggressive sound and slap-like playing style (even though I believe he mostly plays with a pick on the album) complement the atmosphere and overall sound of the band exquisitely. He adds tremendous groove to the whole experience, with decent technicality and tasty choice of notes. However, the band seems to diverge from dissonance and embrace some more consonant aspects of math rock, but don’t slow down on the energy of the music or the technical delivery. For example, there’s no crazy 9/8 bars with mesmerizing subdivisions like in the middle of “Decayer”, but there are interesting and challenging moments all throughout: “CTTL” has that very cool riffs, and a structure that borrows heavily from post-rock, “Miocene Dream” is very atmospheric, especially with the guitar solo, and “Mediatation” sounds like stoner metal. No need to say that it’s pretty diverse. All of my previous qualms with the project vanish with the apparition of a bass player. 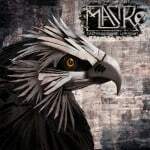 Now, Masiro feels complete, and not just an interesting oddity. They’ve shown us, with Technocologist Unknown, that they are more alive than ever, and ready to kick butts. Their new album is truly their own sound, a blend that sounds like post-mathcore. It’s recommended for every fan of math rock, post-rock, mathcore, and prog in general.